Colorectal carcinoma is the third most frequently diagnosed malignancy in the United States, accounting for roughly 50,000 deaths annually, as indicated by the American Cancer Society (ACS). The LoVo xenograft model aids in the discovery of innovative anti-cancer drugs, by accurately reflecting molecular characteristics of human tumors. The LoVo epithelial cell line was isolated from a metastatic tumor nodule fragment in the left supraclavicular region of a 56-year-old Caucasian male patient with colorectal adenocarcinoma by Drewinko et al. in 1976. The LoVo cell line is a well-differentiated cell line that presents most of the properties of intestinal cells, including the formation of acinar structures, microvilli, a glycocalyx, desmosomes, adherens and tight junctions, as per a 2003 study in Oncogene. LoVo has proven to be a potent tool to study loss of epithelioid organization. LoVo cells are negative for expression of colon antigen 3 and colon-specific antigen-p (CSAp-). Also, these cells express N-ras, H-ras, Myb, c-myc, K-ras, sis and fos oncogenes. A 2012 study by Zou et al. used the LoVo cell line and xenograft to demonstrate the anticancer properties of Beta-asarone, a component of the common traditional Chinese medicine Acorus calamu. Results presented the novel finding that β-aserone induces apoptosis and reduces tumor growth in colon cancer via mitochondria and caspase pathways. The study by Piotrowska et al. (2013) used the LoVo cell model to compare the cytotoxicity of known anticancer agent DMU-212; results indicated that induction of apoptosis is due to upregulation of pro-apoptotic transcripts (Bik, Bak1, Bad, Bok, p52, Apaf1, Noxa) and downregulation of anti-apoptotic factors (Bag1, Bcl-xL, Bcl-2) and that cytochrome p450 catalyzes DMU-212 biotransformation that is critical to anticancer effects. Finally, the 2016 Oncology Letters study (Chen et al.) 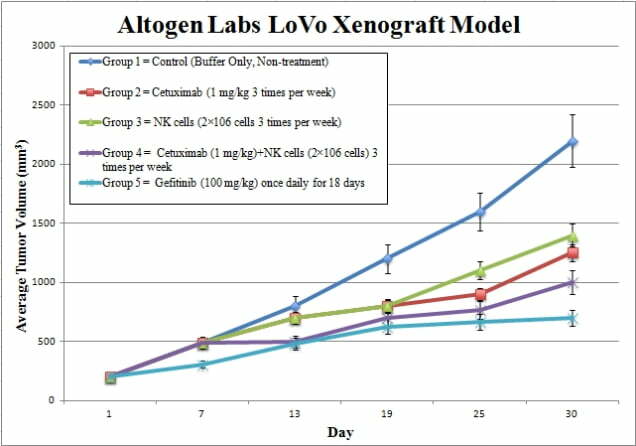 used the LoVo xenograft model in testing efficacy of cetuximab to mediate activity of antibody dependent cell mediated cytotoxicity (ADCC) via natural killer (NK) cells by increasing specificity on epidermal growth factor receptor (EGFR) positive colorectal cancer cells; results showed cetuximab successfully increased the intensity of ADCC activity which could provide a potential immunotherapy for CRC patients exhibiting metastasis and EGFR expression. The LoVo cell line is used to create the CDX (Cell Line Derived Xenograft) LoVo xenograft mouse model. The LoVo xenograft model is a preclinical system that allows an understanding of the mechanism of action (i.e. quantitation of gene expression changes, pathway analysis, biomarkers) following treatment with VEGR-TKIs (e.g. cediranib). Cells are collected by trypsinizing the cells. Viability is then determined with trypan blue, requiring a minimum of 98% viability to initiate the study. Suspension cell concentrations are adjusted to the appropriate density needed for inoculation. After dilution to the correct concentration, one million LoVo cells with 50% Matrigel (100 µL vol) is injected subcutaneously (s.c.) in the flank of each mouse (athymic BALB/C, 10 to 12 weeks). Calipers (digital) are used for measuring tumor progression. Randomization of mice into the appropriate treatment cohorts marks the start of the study. Test compounds are injected as instructed by the client. Tumor measurements and mouse weights are documented (client specified days of measurement). At end of study, the animals are euthanized humanely and a necropsy is performed to remove tumors. Tumor weight is recorded and is digitally imaged. Tissues are collected by standard gross necropsy. Tissues are snap frozen or submersed in RNAlater or nucleic acids isolated. Animal handling and maintenance at the Altogen Labs facilities are IACUC-regulated and GLP-compliant. Following acclimatization to the vivarium environment, mice are sorted according to body mass. The animals are examined daily for tumor appearance and clinical signs. We provide detailed experimental procedures, health reports and data (all-inclusive report is provided to the client that includes methods, results, discussion and raw data along with statistical analysis). Additional services available include collection of tissue, histology, isolation of total protein or RNA and analysis of gene expression.